Anyway, let’s get back to tips. If you can make sustainable progress, it is better to train with singles. Here is the logic behind this statement. One-Arm Chin-Up is a complex feat of strength. It has lots of details to work on. Different parts of the move require individual attention. It is not some low-skill exercise like Lat Pulldown or Bench Press. It is completely different kind of beast. It is obvious that your initial goal should be completing just one perfect repetition (hence the feat of strength category). That is why it is great to train yourself in a feat-of-strength way with singles. However, it will work only if you can divide the whole progression into really small steps. One of the best ways to implement singles is Rest-Pause Training. Let me explain it to you. Pick progression step that is fairly hard, but you can do three perfect reps in. Perform single rep with right arm. Rest for 30 seconds. Then perform single rep with left arm. Rest for 30 seconds. And so on until you hit 5-6 singles per arm. Call it a day. Return 2-3 days later and repeat. Usually it would take couple training sessions to hit 10 singles per arm. You have several options after that. You can either shave off 5 seconds from rest periods and work back up to 10 singles per arm, or you can pick a bit harder variation and start over with 5-6 singles. Single repetition consists of 4 phases: bottom hold, positive phase, top hold, negative phase. Time required for completion of all these phases combines into total called “time under tension”. When we are working with singles, it’s important to understand that progress can be measured in different ways. And increased time under tension is one of them. So if you struggle with adding sets or intensity don’t forget that you always can increase time under tension. Rest-Pause in not the only way to progress in singles. There are tons of progressions toward the One-Arm Chin-Up. The most effective are considered rope or towel assisted, finger assisted and rock climbers’. Rope assisted is the best for me. I can always carry the rope in my bag. It feels the most natural. 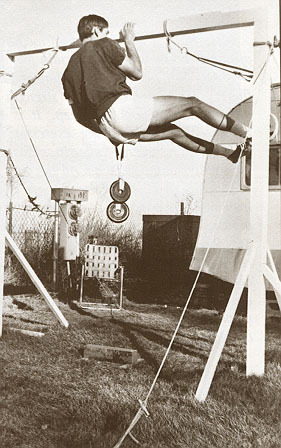 The main thing is that with rope assistance you can adjust intensity similarly to the barbell. Just count the fists on the rope and you’re all set. It’s very important for me. So you get it. Pick progression that suits you. One-Arm Chin-Up is not that exercise that you want to overdo. Firstly, you can’t progress fast in it. Secondly, because of increased risk of injury. Once a week works awesome for me. You should experiment to find out how’s best for you. UPDATE: Depending on intensity you can handle, you can add more frequent work and see how it effects your progress. For example, if you can do partial OACU reps (2/3 of range of movement and harder) and weighted negatives, you can try adding bodyweight negatives every day and see what impact it will make on your progress. One-Arm Chin-Up Negatives are quite powerful tool in your arsenal if used properly. How to use them? Count time of the comedown. 6-12 seconds are optimal for me. Add weight to them when you hit at least 3 sets of 12 seconds per arm. If you don’t want to add weight, you can pause at different points of the descent. My preference is One-Arm Chin-Up Negative with 5 second hold at the top, 5 second hold at 90 degrees and 5 seconds hold in the flexed hang (near the bottom of the movement). Also you can mix assisted positive phase with full negative. For example, perform Rope Assisted OACU but at the top release assisting hand and perform full OACU Negative. This is good intermediate step in learning OACU. In my opinion, One-Arm Static Holds are also very useful. Bottom hang is useful for grip strength and endurance. 90 degree hang is useful for strength in the middle part of OACU and moving past sticking point. Top hang is generally useful in One-Arm Chin-Up work. Practice them but don’t overdo. That’s it. I hope it will help you in your quest for the One-Arm Chin-Up. Thanks for reading and don’t forget to subscribe and like. First time here. Awesome blog and great post. Well done. What’s your opinion on one arm negatives with static hangs e.g static hang at top, lowering to 90 degree static hang. Is that worthwhile? Great article. Well, I think it worth a try, Ben. It should have positive impact on One-Arm Chin-Up ability. Of course if you make it progressive. Thanks for commenting. Try it and let me know how it worked for you. I disagree with what you said about the eccentric oac/oap’s. These were very effective in allowing me to achieve the OAP. Thanks for commenting, Daniel. I think, I’ll experiment with negatives some more and will review my position if it works better. Hey, nice site! Here’s a few more precisions about what I find works really well for the one arm chin. First, negatives are not useless at the beginning. I thing that once you’re able to do a few good negatives, you should just replace them with the static holds. For the statics holds, I found that I had a much better improvement if I was working them using maximum strength holds. Per example, I’d do 2×5 different angles holds for less than 6 seconds. But everytime I do a hold, I try to lift, but can’t cause I’m not strong enough. At some point, you get strong enough to lift, but you still want to do static holds, so you just add some weight, per example hold something just heavy enough so you can lock it for around one second at each angle. Then you use that approximate weight until you can hold each angle for close to 5 seconds. In one training, I use 2 sets of 5 angles (with enough rest between each angle), then 2 sets of 2 or 3 Archer chins, and as soon as I could, I replaced the Archer chins with box one arm chins, then progressively lowered the height of the box. Still do the static holds with the box chins (box chins with arm pretty straight, almost dead hang but still not quite). For various reasons, that’s the fourth time I have to learn the one arm chin over the last 7 years, and this time, screw that, I’m not losing it again. Hope my insight was helpful! Thanks for reply, bro. Nice addition. I’ll try some of that stuff in my training. Man, I’m finding some great articles here. I mean, most people don’t write about One-Arm Chin-Ups or stuff like that, Great read, thanks! Thanks. That’s why I started RS. There’s not much information on such kind of training out there. So a lot of experimentation is required. And if somebody, like me, is interested in this I can share my experience with him/her and make his/her training better and more effective. Pingback: Practical Tips to Improve Your Pull-Up Performance | RoughStrength.com - Gain Strength, Build Muscle, Lose Fat, Get Awesome! A great read, and thank you because I was wondering of a few things with my OAC training. I’m, progressing my way to a one arm chin and currently at a stage where I can lock at the top and at 90 degrees consecutively. Actually after many towel assisted ones I decide to let go of my towel grabbing hand one day and try to descend as slowly as possible. I squeezed my arm so hard that I ended up holding there instead of dropping down….and that actually took me by surprise as I wasn’t even sure I was able to hold. Then I slowly released and again I was surprised I was able to hold again halfway. I giggled (yeah) and dropped, and hurt my bicep and possibly injured my elbow. I’m taking a rest and will come back in 3 weeks to learn to pull up from a 90 degree hold (probably still with a little assistance with a towel). I’m not in excruciating pain, just a little uncomfortable. But is this a skill that is easy to lose? I’m worried I might not be able to do it again once I come back to it (other than not being able to heal fast enough). Thanks. My answer is if you even lose this skill you’ll be able to regain it faster than the first time. It all depends on individual. Well done there is a lot of great natural ways to get strong and ways to test your body’s ability to everyone strength ! Will look forward to reading all the articals thanks for all the information and will look forward to reading and testing out new ways of training . No problem, Daniel. Absorb the knowledge. how do you do one arm chinup negatives, or even a one arm flex hang? i can do 15 chinups and whenever i attempt a one arm flex hang, i immediatley drop down. how do i condition for these? You can try assisted One-Arm Top Hangs. To perform them, you will need a rope, a towel, or the all-mighty pulley system. With the first two, grab a bar with one arm and the assistance with the other. Pull yourself up and hold. The lower you grab the assistance (the towel or the rope), the harder the exercise will be. For the last one, read the article in the link. Let me know how it works, Drarry.